From the studio that brought you Master Reboot comes a first-person story-driven puzzle game, set in the beautiful, haunting cyber-world of Elysia. Collect unique hand powers, discover multiple endings and choose your own destiny as you unravel the mystery of your digital afterlife. Take your first steps to paradise by uploading your soul to Elysia, named by critics as “the single most important development in the history of the human race” (Era Magazine, 2027). As the latest state of the art Digital Soul Provider, Elysia is a sprawling server where your memories and dreams become reality. Our patented SoulSync system allows you to choose the memories you want to enjoy for eternity; whether you are a living user or you simply wish to leave a lasting testament of your life that the whole family can relive at their leisure. In Elysia, death has no dominion. In Elysia, life has no boundaries. Cast off your mortal shackles and discover the secret to immortality in your digital afterlife. Discover Elysia. Then, now and forever. Psychological Adventure with Exploration & Puzzle elements: Interact with cryptic logic puzzles, make psychological decisions and explore memories to unlock the secrets of your identity. Harness the abilities of Elysia: Discover new powers that will assist exploration and puzzle solving by phasing, building, destroying or corrupting. Unique visual style: There is a beautifully simplistic emphasis on striking shapes, strong colors, and beautiful effects and lighting to elicit a variety of emotions within The Elysia. Compelling storyline: A tense, but thought-provoking narrative with multiple outcomes, and leaves you yearning to explore all avenues of the lore. Dynamic adaptive environments: Use your abilities to manipulate your surrounding environments. Collect your powers and re-visit memories to unlock previously hidden areas. Packed full of content: With 6 chapters consisting of around 40 unique locations, expect between 8-12 hours of thrilling gameplay with the full release. Atmospheric soundtrack: Provides the perfect musical backdrop which subtly enhances the game through well-crafted association with the memories you explore. 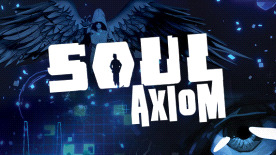 ©2015 Wales Interactive Ltd. Wales Interactive Logo, Soul Axiom, Soul Axiom Logo and Soul Axiom figures are trademarks of Wales Interactive Ltd. All rights reserved.